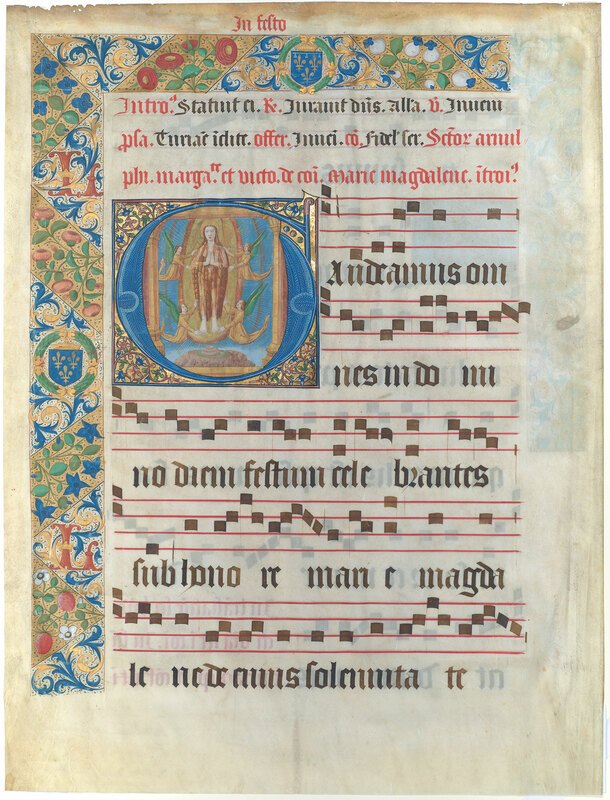 Purchased on a grant provided by the Bernard H. Breslauer Foundation and with contributions from the Visiting Committee to the Department of Medieval and Renaissance Manuscripts, 2016. Leaf from the Gradual of King Louis XII and Queen Anne de Bretagne; broken up by 1840 (Le Roux de Lincy, Vie de la reine Anne de Bretagne..., Paris, 1860-61, II, 86); this leaf sold in London, Sotheby's, 5 July 2016, lot 45, when it was bought by the Morgan. Ms. single leaf with historiated initial portraying the levitation of Mary Magdalene, from the Gradual of King Louis XII and Queen Anne de Bretagne. Contents: On the recto can be found the conclusion of the Offertory and the Communion for the feast of the Seven Brothers (July 10); the rubric indicating that the feast of the Translation of St. Benedict (July 11) can be found in the Common; and the rubric for the feast of St. Turiavus (July 13). On the verso are the incipits for Turiavus (Introit, Offertory, and Communion); the rubric indicating the feasts of Sts. Arnulfus (July 18), Margaret (July 20), and Victor (July 21) can be found in the Common; and the beginning of the Introit for the feast of Mary Magdalene (July 22). Decoration: 1 large historiated initial, 2 illuminated borders containing the arms and initial L of King Louis XII. Artist: Master of the Paris Entries (Jean Coene? ), fl. ca. 1498 - 1530.